A few months ago, Brill sent me a copy of Professor Graeme Auld's commentary on the LXX text of Joshua for a review I am doing in JETS on another commentary in this series. The reason for having this volume for my review is that it sets the tone for those volumes that follow in the series, and it is Auld, people! He defines the series by his contribution in this Joshua volume. I should mention that Graeme Auld is the Doktorvater of my historical books professor in my masters studies. So I am excited to at least glean from this volume a fraction of the knowledge that Professor Brian Aucker was able to gain from his time with Auld. 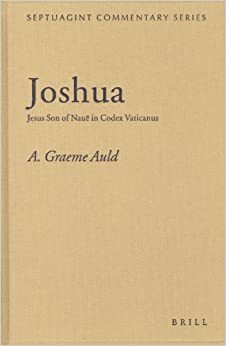 Auld, of course, has published many commentaries on Joshua, and this one will certainly be unique to those previously appearing from his desk. First, like the rest of the series, Auld is not concerned with an eclectic text like one would find in a Göttingen LXX, or earlier in Rahlf's. Rather, Auld is concerned with the Vaticanus (B) text as an artifact that one can more plausibly explore its date and place of reception. For Auld, an eclectic text will always be considered hypothetical in the end. Second, Auld is concerned to show how weird the Greek in Joshua is. I noticed earlier in Jennifer Dines' note on this commentary that she says, "[Auld] does this by a rather brutally literal translation of his 'virtuosic' and 'flexible' translator (cf. p. xix), which shows where the Greek departs from normal usage." Again, this aspect of his commentary probably has a lot to do with demonstrating the uniqueness of B as one witness of the LXX-Joshua text. Third, and this point is true of the rest of the volumes I have seen from this series, there is a text portion of the commentary and there is a commentary portion. Since most of us cannot afford a copy of B from the Vatican (the latest copy I saw for sale was for $11k USD! - later i found some a bit cheaper), much like the Loeb series, Auld gives his textual opinion of the original B with the Greek of Joshua on the left page and his literal English translation on the right. This is so helpful. For the organization of the text, Auld follows the 103 divisions indicated by the first-hand of B. Finally, in the commentary section we get classic Auld, learned, aware of the issues, and crisp logic. Also, it should be noted, in the intro, Auld gives background on B that is referred to in later volumes in this series (Cf. Glenny, Hosea). My recommendation for this volume is the same as it has been for every other volume I have seen in this series: If you can get your hands on one, do it! The price will prohibit most from making this move, but libraries, financially stable churches, and independently wealthy people should do it! I kid a bit, but I find that we are in a stage of biblical studies history where it is becoming more broadly understood that the LXX (sorry to say "the LXX," it's just easier) is important to more than just scholars of specific foci. I personally believe that pastors that preach and teach should be consulting the LXX, and this commentary series pared with NETS will make this more possible. Maybe a cheaper, paperback, or kindle version will be supported by Brill... Not sure. But it is a great series!